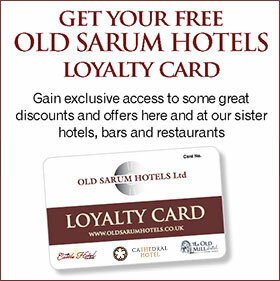 Cathedral Hotel Salisbury – For the best rates, book direct! The Cathedral Hotel & Bar is located in the heart of Salisbury, just a few minutes’ walk from the Salisbury Cathedral, shops, restaurants and local attractions. We are just 20 minutes’ drive from Stonehenge and the rolling countryside of Wiltshire, with all its historical gardens, houses and walkways. Book Bed & Breakfast with a double room from just £50 per room, per night for selected nights at Cathedral Hotel this Spring! Call us on 01722 343700 for the latest availability. The bedrooms are decorated in a contemporary style and include free WiFi, a well-stocked tea and coffee station, hairdryer, ceiling fan, small safe and ironing facilities. Our bathrooms have heated towel rails and we supply the best quality towelling. All our double rooms have King Sized beds. We have two sets of adjoining rooms that sleep four and are very popular with families. Our rooms do not have air conditioning or telephones, The public areas are fully air conditioned. On Sundays and throughout the week, we offer a quiet, relaxed environment. 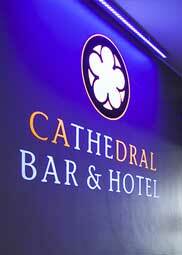 On weekend nights the busy ground floor venue bar is open until 2am and is part of the Salisbury club circuit. All our rooms have secondary glazing, but you will hear noise in some of the rooms on these nights. Some Thursdays and bank holiday Sundays may also be busy and open till late. Bedrooms are accessible via stairs or a small wood-panelled passenger lift. Parking is available in nearby pay and display car parks and we have a loading bay at the hotel that can be used while you check in/out. The public area on the ground floor is of a traditional British pub feel offering a great selection of cask ales, wines, spirits and lagers. Food is available until late in our restaurant, bar and garden areas. At weekends you can have a more relaxed experience in our lounge restaurant area or you can enjoy viewing football, cricket, rugby and other sporting events with the locals in the bar areas. Breakfast is served from 7 until 10am Monday to Saturday and 8 until 10am Sundays. 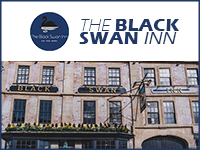 To make a reservation telephone: 01722 343700 and a member of our team will handle your booking personally, or click on ‘BOOK NOW‘ to make your reservation online securely at the best rates online.